Forensic Textile Science provides an introduction to textile science, emphasizing the terminology of the discipline and offering detailed coverage of the ways textile damage analysis can be used in forensics. Part One introduces textiles and their role in forensics, including chapters on fibers, yarns and fabrics, garment types and construction, and household textiles. Part Two covers analysis of textile damage in a forensic context. Key topics include textile degradation and natural damage, weapon and impact damage, textile ripping, and ballistic damage. 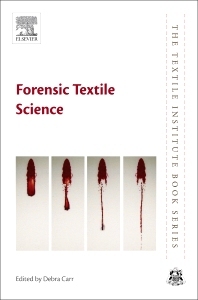 This book is an important reference point for all those interested in textile damage and the role of textiles in forensics, including academics, post-graduate students, and forensic scientists. Dr Debra Carr is a Senior Lecturer at the Centre for Defence Engineering at Cranfield University. She has extensive expertise in textile damage analysis, and is engaged in research into body armor optimization, ballistic impact, protective clothing and textile science, and the role of textiles in forensics. Dr Carr is a Chartered Engineer, a Fellow of The Institute of Materials, Minerals and Mining and a Professional Member of The Forensic Science Society. She has more than 50 academic papers to her name.